Bladder stones are collections of mineral crystals that combine together in the urinary tract. They can cause discomfort and lead to more serious problems that require the care of a veterinarian. 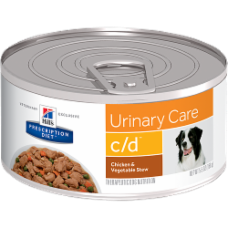 Because the food your dog eats plays an important role in his or her overall health and well-being, Hill's nutritionists and veterinarians have developed clinical nutrition especially formulated to help support your dog's bladder health. Dogs need the right balance of minerals to maintain good bladder health. Excess minerals can encourage the formation of crystals in the urine, which can lead to the creation of bladder stones.